To control the servo from CircuitPython we'll use its built in PWM, or pulse-width modulation, signal generation capabilities. Be sure to read the CircuitPython analog I/O guide for more details on PWM signals! Be sure your hardware is wired up as shown on the previous page, and your servo power supply is turned on (you might notice the servos jerk or move slightly when the power is turned on--that's normal!). The frequency of the PWM signal. This is an optional value that we're specifying as a keyword argument to tell the PWM output that we want a signal with a frequency of 50 hertz. The frequency is how many times per second the servo signal changes and for most servos they expect a ~50 hz signal. Now we can control the position of the servo by changing the duty cycle of the PWM signal. If you aren't familiar with PWM signals and duty cycle be sure you've read the CircuitPython analog I/O guide PWM page for more background. 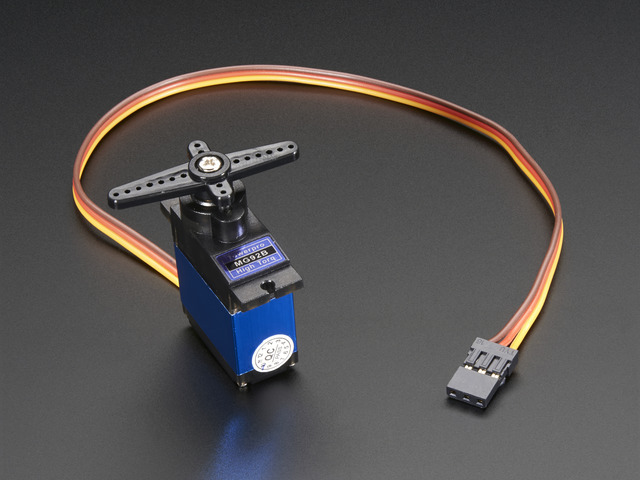 With a servo motor it will change its position depending on the pulse length of the signal being sent to it. Specifically a 1 millisecond high pulse tells the servo to move all the way to one extreme (left or right) and a value of 2 milliseconds will move all the way to the opposite extreme. 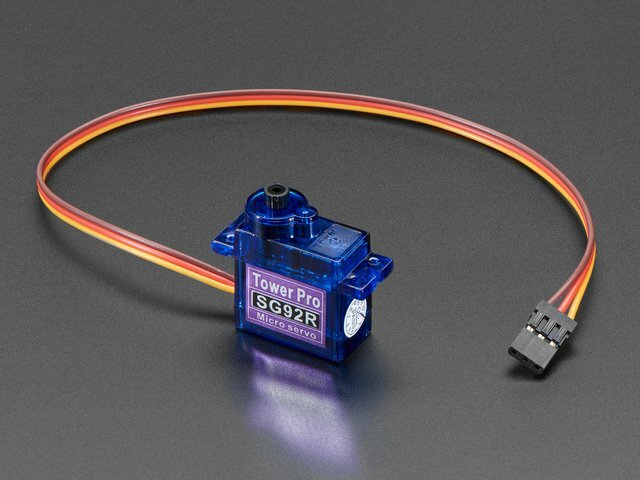 Any value in-between 1 to 2 milliseconds will move the servo to an appropriate in-between position. 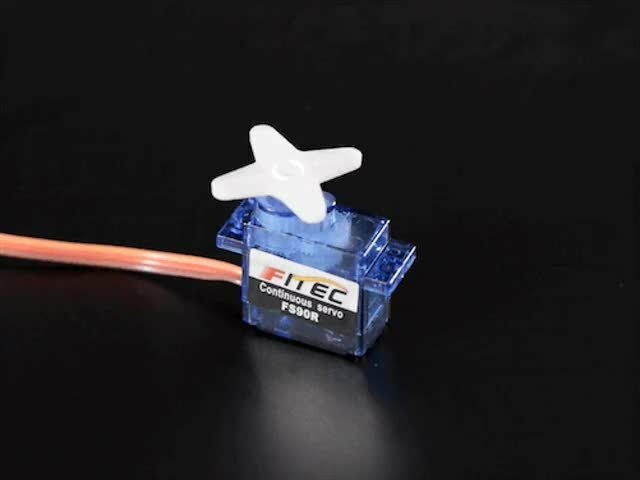 For example a value of 1.5 milliseconds will move the servo to its center or middle position. Note for continuous rotation servos they don't have a concept of moving to a specific position. Instead they will rotate freely in a circle and change their speed depending on the pulse length sent to them. A 1 millisecond pulse moves as quickly as possible in one direction, 1.5 millisecond pulse stops movement, and 2 millisecond pulse moves as quickly as possible in the opposite direction. You can pass this function a pulse width in milliseconds and it will convert it into the appropriate duty cycle value to control the servo. The function assumes a frequency of 50 hz by default too, but you can change it by specifying the frequency keyword too (however you don't typically need or want to change this unless you also changed the frequency of the PWM output!). 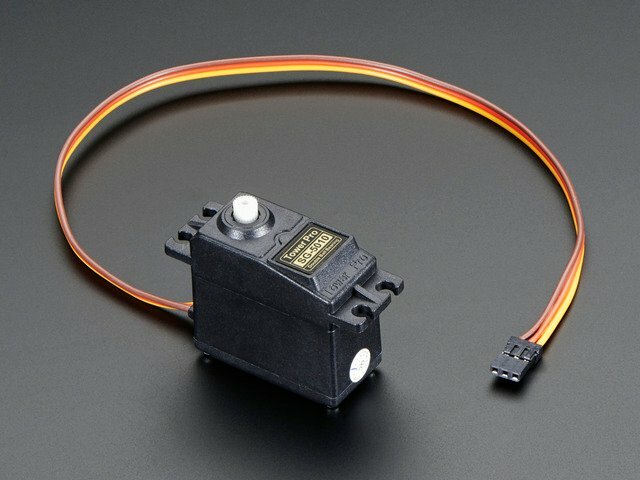 If you don't see your servo move be sure the power supply is turned on and connected to the servo. Double check all of your wiring connections and that the output for the signal supports PWM signals too! You should see the servo move about 180 degrees to the opposite position. Experiment with setting any value in-between 1.0 and 2.0 to see how the servo reacts. 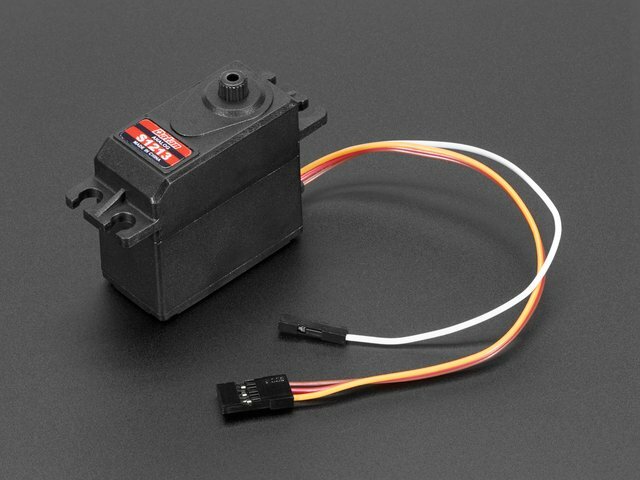 Another way to control servos is with a handy Adafruit CircuitPython Motor module which simplifies setting the duty cycle to control servos (and even allows controlling servos from different PWM hardware like the PCA9685 board). To follow this approach you'll need to install the Adafruit CircuitPython Motor module on your CircuitPython board. You can also download the adafruit_motor folder from its releases page on Github. Before continuing make sure your board's lib folder or root filesystem has the adafruit_motor folder copied over. Notice the servo class needs to be told what PWM output the servo is connected to for your board. If you're following the wiring and this guide it will be a PWM output on board pin 5 (be sure to create this with a 50 hz frequency as shown!). actuation_range - The range in degrees of the servo movement. The default is 180 degrees. min_pulse - The minimum position pulse length in microseconds (default 1000 us). max_pulse - The maximum position pulse length in microseconds (default 2000 us). Here we've change the minimum pulse from the default 1000 microseconds to 750, and the default maximum pulse from 2000 microseconds to 2250 to ensure we get the full sweep as some servos differ. Some experimentation may be required! Controlling the servo is simple once you have the class created, just set the angle property to a value from 0 to 180 degrees! 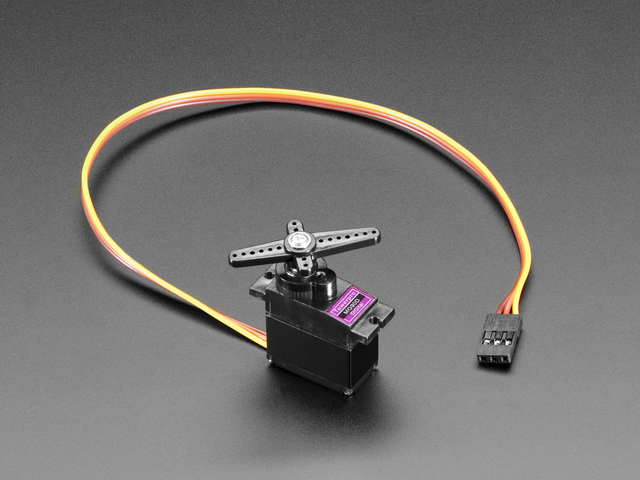 Notice each time you set angle the servo springs to life and moves! 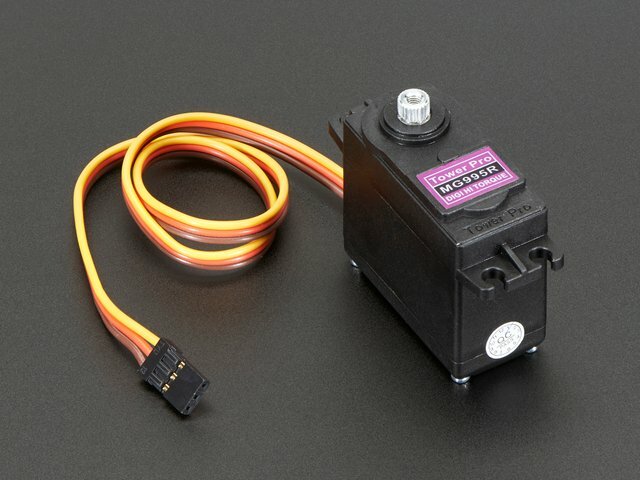 If you don't see the servo moving be sure you have it wired and powered exactly as shown. Also make sure you've created the PWM output exactly as shown above too (note the 50 hz frequency!). With these servos you set the throttle property to a value from -1 to 1 (or anything in between, including fractional values). Where -1 is fully speed 'backwards' and 1 is full speed 'forwards'. A value of 0 should stop the motor (but your servo might need to be trimmed a bit and have a small value set that stops its movement instead of zero, experiment with values yourself to see). # Main loop will run forever moving between 0 and 180 degree extremes. Check out all of the examples in the Adafruit CircuitPython Motor module too! This guide was first published on Jan 15, 2018. It was last updated on Jan 15, 2018. This page (CircuitPython) was last updated on Apr 22, 2019.